Guys! It is nearly Easter! You know what that means, right? That’s right! I will be feasting on roast leg of lamb at my parents’ house this weekend! Wait…that’s not what you were thinking? Well, yes, I suppose it is time to be thinking about hot cross buns again. But this year, let’s do something a little different. A little less time consuming, perhaps? I know that you have probably already hit your yeast and dough rising quota for the weekend with these frosted orange rolls. I also know that there are those of you who are just plain afraid of working with yeast. For you, I made these. They’re scones. They’ve got all of the flavors of a hot cross bun going on. They’ve even got the icing cross on top of them. But you can pull these guys together in about 30 minutes, start to finish. No yeast involved. No waiting on your dough to rise. Now THAT’S the kind of thing I’m willing to actually get up and make for breakfast or brunch. Ps: Come back later this week and I will have a pretty baller recipe for you to serve for Easter dessert. Further side note/shameless plug: My family and I are two short months away from participating in the Take Steps Walk to raise money for Crohn’s and colitis research. We are hoping to raise $1,500 to help find a cure for digestive diseases that affect over 1.4 million Americans – myself included. To read more about my battle with ulcerative colitis and why I am walking, check out my story. If you would like to donate to our team, visit our team page. Every little donation helps, and means so much to each of us! In a large bowl, sift together the flours, sugar, baking powder, soda, salt and spices. Using a pastry blender, cut butter into dry ingredients until the mixture resembles coarse sand with a few pea-sized pieces. 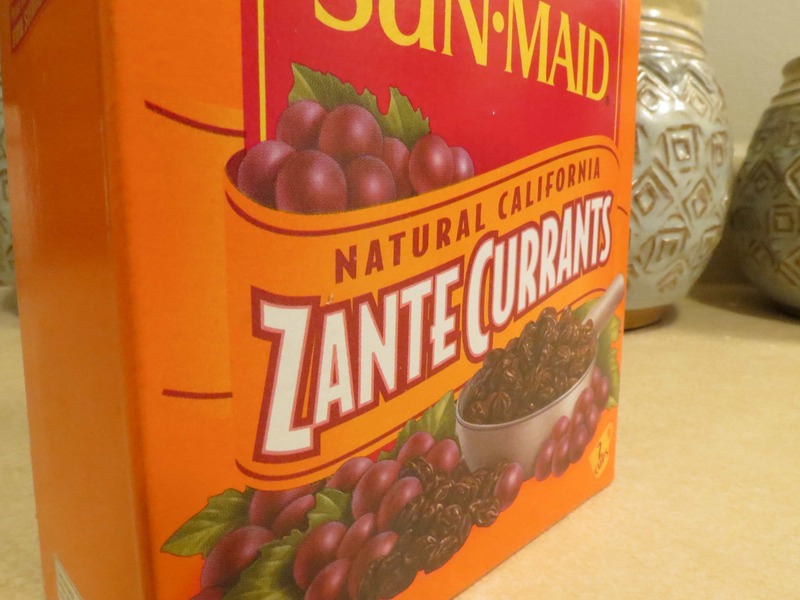 Stir in currants. In a separate bowl, whisk together ½ cup of the the buttermilk, egg and vanilla. Add to the flour mixture; stir just until combined. Turn dough onto a floured surface and knead 10-12 times. With a floured rolling pin, roll dough to ½-inch thickness. 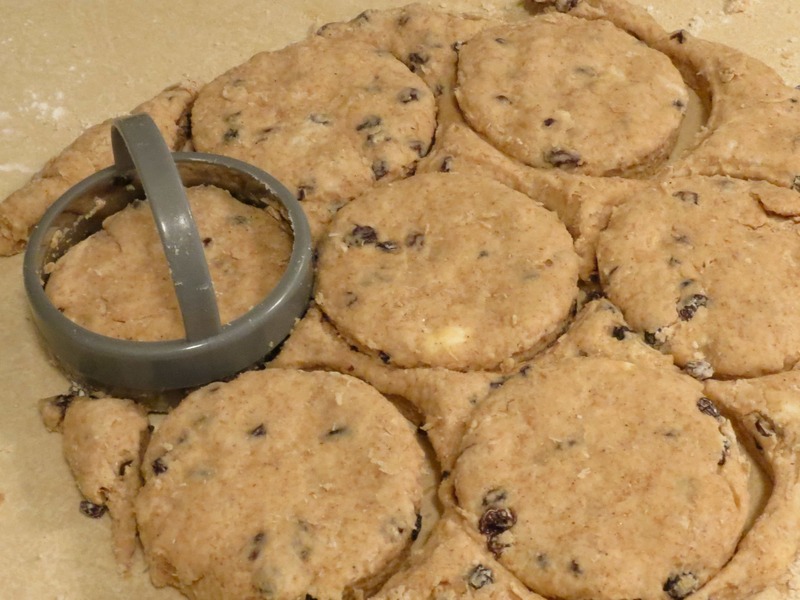 Using a 3-inch biscuit cutter, cut out scones and transfer to prepared baking sheet, re-rolling scraps as necessary. 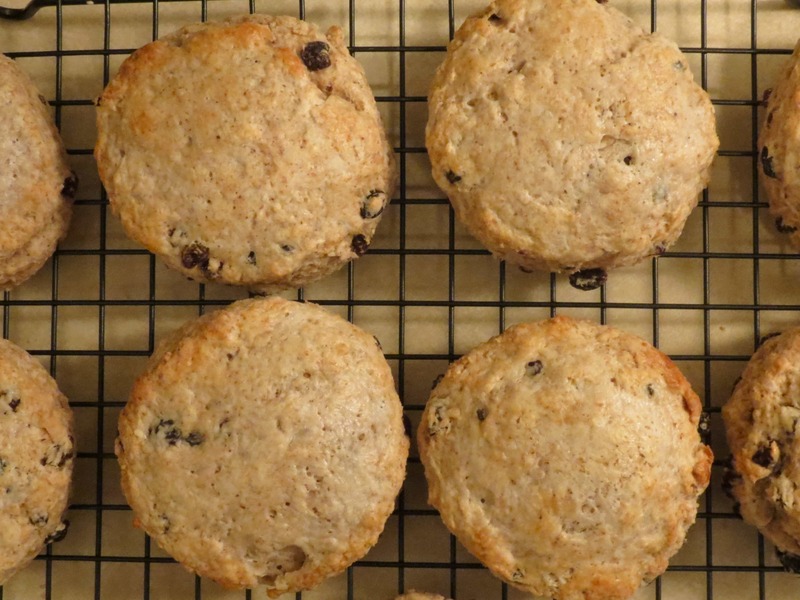 Brush the tops of the scones with the remaining tablespoon of buttermilk. Bake for 12-14 minutes, or until the edges are golden. Transfer to a rack to cool before glazing. While scones are cooling, whisk together the powdered sugar and milk in a small bowl. Start with 1 tablespoon of milk and add more, bit by bit, until you achieve a thick glaze that can be piped onto the scones. To pipe glaze onto the scones, transfer glaze to a zip-top bag, keeping the glaze concentrated in one of the bottom corners (you are using the bag like a piping bag here). 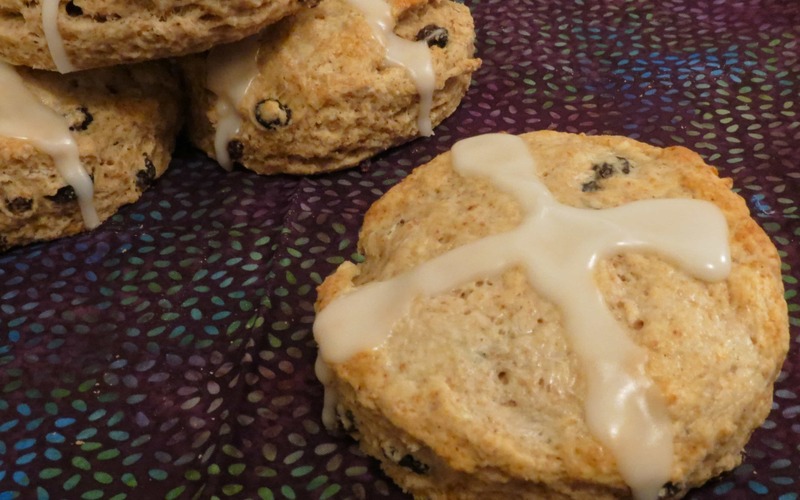 Use scissors to snip off a small bit of the bottom corner; pipe glaze onto mostly cooled scones in the shape of a cross. These look great! 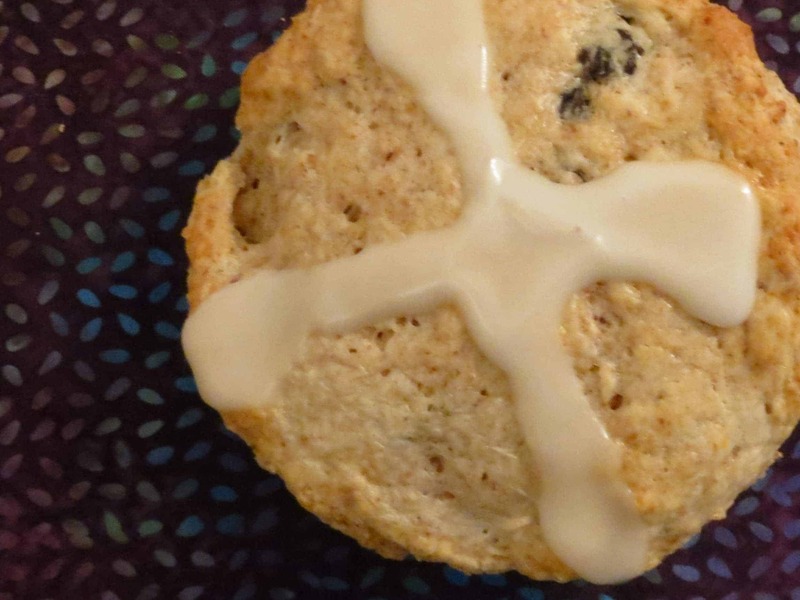 I think I’m going to try making traditional hot cross buns later this week, but I love this variation! Oh, I hope you share your hot cross bun escapades! Thanks! And you could certainly up the amount of WW flour if you wanted, or even just use WW. I chose to use mostly AP here to make them closer to traditional hot cross buns. Yum! These scones look scrumptious. 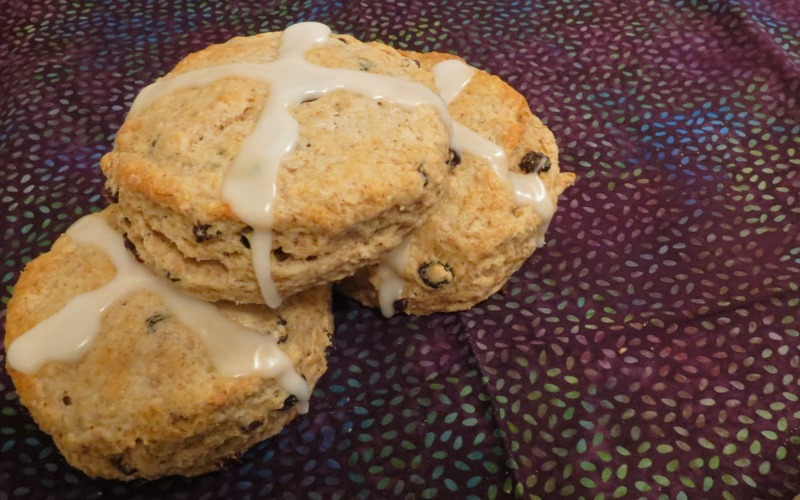 What a great idea with hot cross scones.